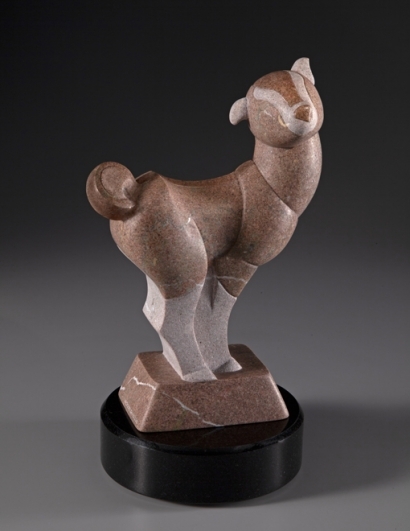 “Simplicity” is a stone sculpture of my namesake goat, born almost on my birthday this year. I knew quite a lot about goats from my research for Djali, the dancing goat, in Disney’s “The Hunchback of Notre Dame.” I have been a goat enthusiast ever since. My friend Hillary lives in northern California in a house with a big field in back. She and Mark, her significant other, were wondering about alternatives to mowing the field, and decided it could be grazed. They chose goats because, through their research, they discovered that goats are interesting, intelligent, and fun . . . much more fun than a tractor and much less complicated than horses. Hillary told me last summer that she was planning to have one of her does bred and she would have baby goats in the middle of May. 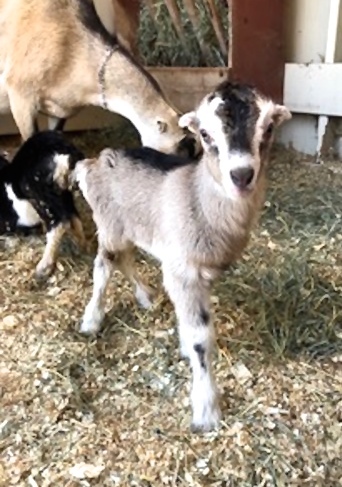 Raptures of joy—baby goats are the best! I requested she name the female after me if the kids were born on my birthday. Ellen-the-goat and I missed being soul mates by a couple of days, but Hillary generously named her after me anyway. 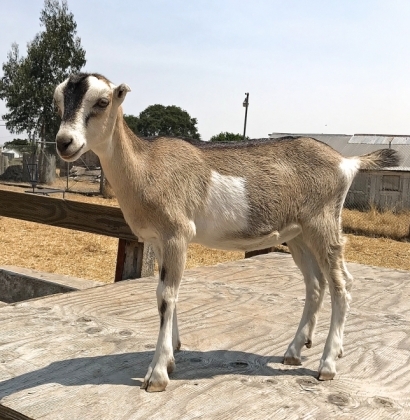 Ellen the Goat was born on May 19. I began designing her sculpture then. 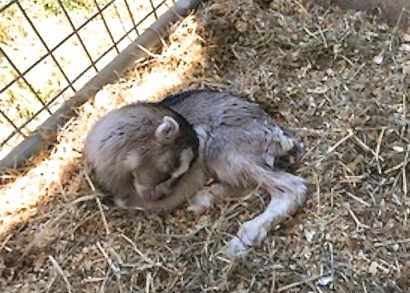 Hillary sent me photos and videos of Ellen-the-goat as a little newborn all cuddled up. Then, only 3 days later, she sent another video of the precocious toddler getting her feet stuck in the hay feeder, and trying to negotiate a small sloping plank. I could see her little brain trying to figure out the abilities of her little legs, wondering why her feet kept slipping on the incline, a brand new world full of puzzles and challenges. At times I find myself wishing for a simpler time. It struck me watching the video of little Ellen trying to figure out her feet that youth only seems simple in retrospect. Really, we were all trying to figure out how to navigate in the world–first physically, and then socially and economically. There is nothing simple about it. There is so much to learn, starting with what to do with your feet. I no longer yearn for the simplicity of youth because it is not simple. Rather, it is a hugely complex process of trial and error, learning from mistakes, creating a foundation on which to build an entire life. I think I will continue to build, rather than go back and try it all over again. Precocious little Ellen the Goat is three days old. I have a continuing conversation with myself and other artists about the quest toward abstraction in art. I think the process of making art is an evolution of feeling and personal perception along with mastering artistic skill in a chosen medium. I was thinking that this evolution would take me from stylization to abstraction. I realized that it is my fascination and love for animals that makes sculpting so much fun. I enjoy researching animals and learning new things about them. I really enjoy thinking about the animal as I am carving it. I like the challenge of creating a pose that captures the essence and personality of the animal. I love to simplify the forms and proportions to simple shapes. I love to tinker with the pose to create lines of action and select which forms to define as curves or planes that guide the eye through the pose. I think “Simplicity” showed me that I am heading in a good direction with my sculpture. It is pretty neat when my own art can speak to me like this. Ellen was three months old by the time I finished making her sculpture.